Right now I am sitting at a Safeway grocery store in my car in Aberdeen, Washington (FYI: lumber capital of the world and birthplace of Kurt Cobain). My RV is at Elma RV park, 20 miles away, which does not have good wifi. However, they did give me homemade chocolate chip cookies when I checked in. Reviewers for the park said excellent wifi. Hmmm…..the cookies do help in healing my disappointment. And today……..thank heaven for free grocery store internet! Torrential rains are keeping me from getting out and about. Being a Sunday, it is an appropriate day for a bit of a rest. Let me share a bit of fun I had recently on my visit to the Japanese Gardens in Portland, Oregon. 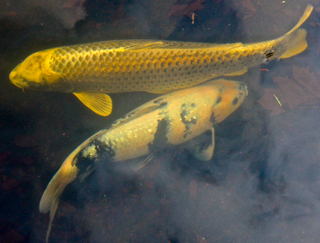 While photographing the Koi fish, the sky began to clear. The blue of the sky and some remaining clouds were reflected in the water. 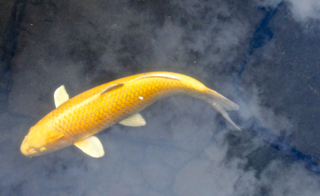 To me it looked like the Koi were swimming in the sky and I was reminded of a particularly fine Muppet movie called “Muppets From Space” which features Cosmic Fish giving some enlightening words to Gonzo ( one of the Muppets): May the fish be with you. Here are my photos of the Cosmic Fish. Love the fish and love the Muppets! Just rewatched the movie last night. It was great. 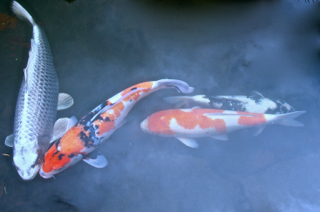 Love watching those Koi.